If you told me today that I was going to war, and I had to choose my kit right now…do you know what optic I would take? I’d bypass all the Eotechs, Aimpoints, Nightforces, Leupolds, and Schmidt and Benders of the optics world and settle on one optic, the Trijicon ACOG. 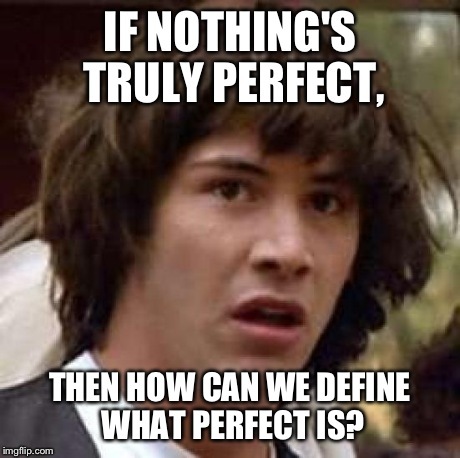 Find out why…plus how to figure out the best model for you (since there’s a lot of them). Well, it helps I’ve already been to war with it once. I’ve also trained extensively with it, put thousands and thousands of rounds downrange with one, and would genuinely trust my life to it. 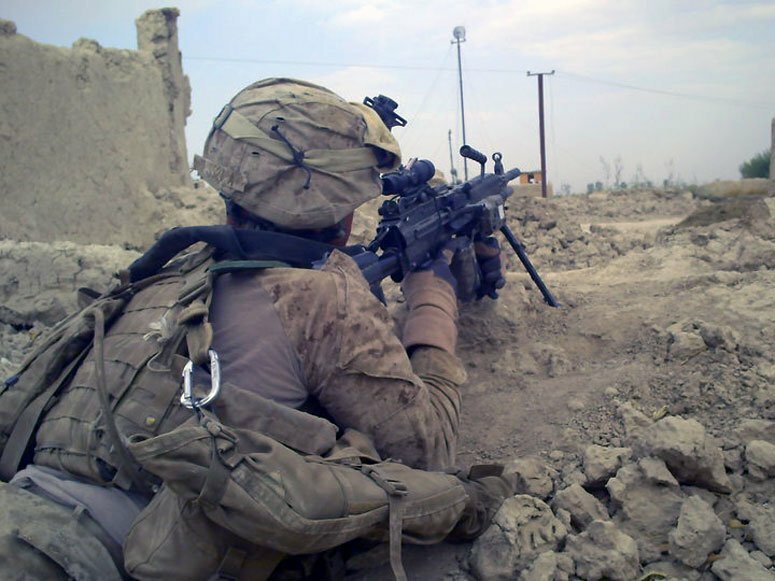 Of all the gear that I carried and was issued two pieces stand out to me, the M240B machine gun and the Trijicon ACOG. They were two pieces of kit I have no complaints about and never saw fail. I’ve seen combat with ACOG, and it performed admirably under pressure, and the design’s versatility and simplicity made it stand out. We’ll take a little more on this later, for now, let’s look at what an ACOG is. ACOG is a name for an entire line of optics that vary in size, reticle magnification, and even illumination power. ACOG stands for Advanced Combat Optical Gunsight. These are fixed power optics that can range from 1.5x to 6x with plenty of options in between. There are a total of 12 different ACOG variants, with well over a dozen different reticle combinations. While some come powered via battery, but they are mostly known for using a mixture of tritium and fiber optics to illuminate the reticle. The fiber optics absorb light and power it during the day. In the absence of light, the tritium kicks in and gives the reticle a slight glow. That long red tube you see on top of ACOG is where light is absorbed and used to illuminate the optic. There are some cons though. The system self-regulates. This means the brighter it is outside, the brighter the reticle is. It is night vision compatible as well. My experience is tied to the oh so sexily named and not confusing at all TA31RCO-A4CP and TA31RCO-M4CP ACOGs. The optics are identical, but the A4CP was designed for the M16A4 and the M4CP for the M4 Carbine. The difference between the two is easy to miss and is due to the fact the optic uses a BDC, and the rifle’s barrel lengths are different. The difference in barrel lengths creates a difference in ballistics to include bullet drop. These particular models are 4X with a 32mm objective lens. Both optics utilize the same BDC reticle layout that extends out to 800 meters. BDC reticles are extremely common on ACOG scopes. The vast majority of ACOG reticles incorporate some form of BDC. When it comes to known distance ranges, I’ve only ever gone to out to 500 yards with the ACOG. I will attest out to 500 yards, after the meter to yards conversion is done, it’s dead on. It made rifle qual every year a walk in the park. 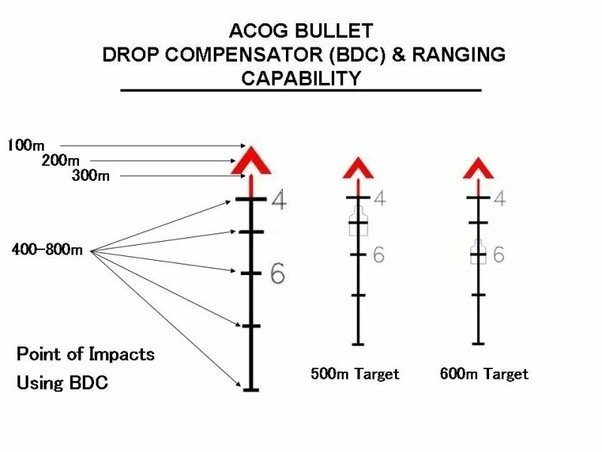 If you’re not familiar with a bullet drop compensating, or BDC, you should be. These specific reticles are popular on most ACOGs and provide predetermined aiming points for bullet drop. The reticle is very specifically tuned to the type of 5.56 load, projectile weight, and the barrel length. The reticle has predetermined aiming points that allow you to place that aiming point on a target and have a reasonable expectation that the round will hit the target. As you can see it’s somewhat self-explanatory. The 4 and 6 are used for 400 and 600 meters respectively. Does this make a little more sense now? If you look to your right, while keeping your hands and arms in the vehicle, you may notice the target perfectly aligning in width with drop down hash marks. Also please notice how the hash marks are slowing getting shorter as they descended. This still isn’t all of them…. The reticle also has a built-in rangefinder. The hash marks, starting at 400 yards are designed to replicate the width of an average man’s shoulders. Since targets get smaller as they get further from the shooter the lines are. In the USMC we shoot at 500 yards on man sized targets and the lines work perfectly. It was always something we made sure to note for young Marines. Admittedly in combat, this isn’t exactly easy to use outside of an ambush situation. It’s merely a tool for the box and does allow for scoping suspicious characters carrying AKs. What Else Rocks about the ACOG? The ACOG is a near invincible optic. In my experience, it’s a freakin’ tank. Going to war is one big test for sure, but people don’t understand just how rough predeployment training can be. We go hard in the desert, in the snow, everywhere. Lots of time on the range and in the field. They get roughed up, and they bounce off walls in MOUT, they ride in Humvees, MRAPS, Tracks and more. My second deployment had me going out to sea with a Marine Expeditionary Unit. This gave the ACOG plenty of time to be exposed to salt water and bumped and dumped in places like the UAE, Romania, Spain, Djibouti, and a few more. After two deployments and five years with an ACOG equipped weapon, I have never had one break on me. I’ve also never seen one go down when used by another Marine. 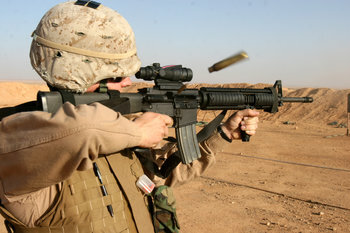 I know more than one guy who was carrying an ACOG when they were hit with an IED. 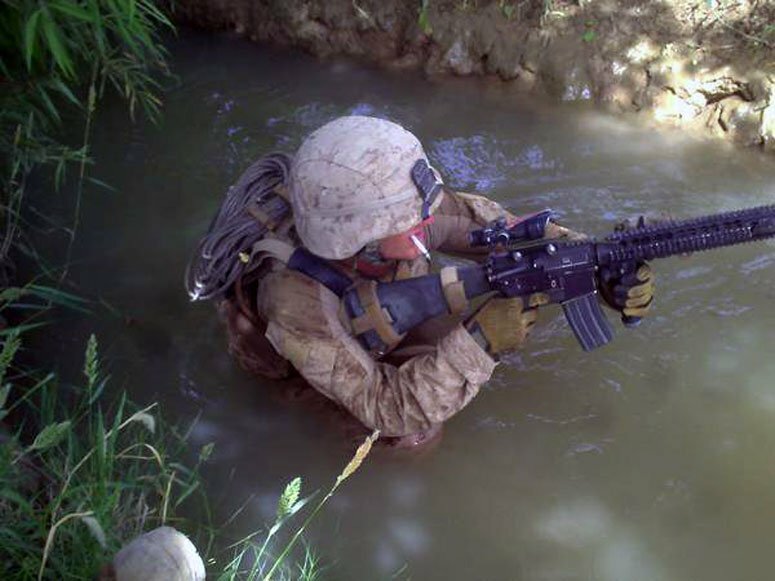 One literally stopped a bullet and saved a Marine’s life once…. Thankfully outside of some minor injuries, my friends and their ACOGs were perfectly fine. From Trijicon’s website, the ACOG is drop proof, shockproof, fog proof and can be fully submerged to 100 meters. Usually, clarity is something we all love to talk about when it comes to optics, but with the ACOG it seems like clarity is second to everything else. However, it does need to be mentioned eventually. 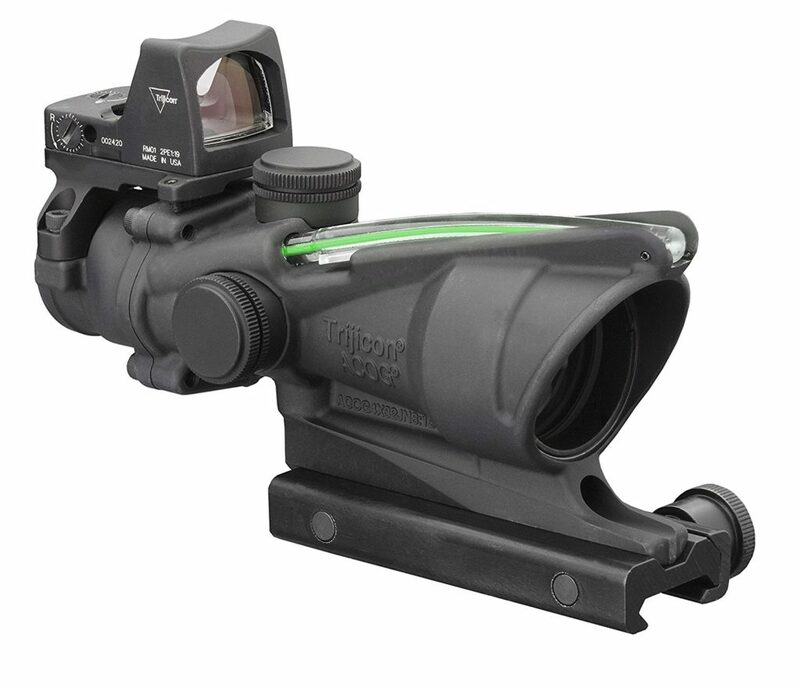 The Trijicon ACOG is a brilliantly clear optic. The glass is magnificent and extremely strong. It allows you to see and differentiate between different potential targets easily. The optic does exceptionally well in low light situations, and unless it is pitch black, you’ll be able to use the optic at night. 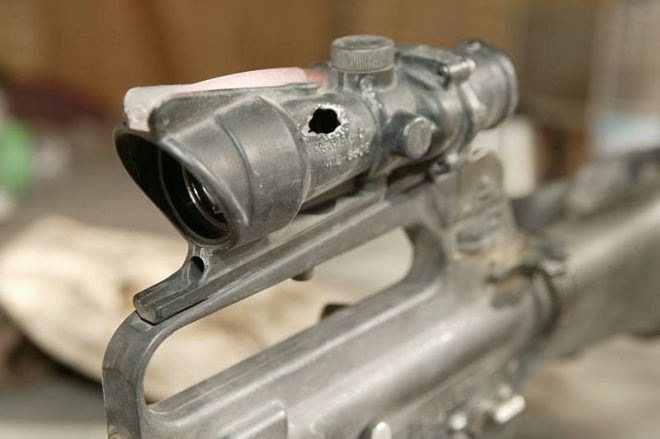 The ACOG’s clarity was a big deal to us. We used our ACOGs to scope any and everything. This includes trash that could be bombs, guys who could be carrying AKs, and for doing more mundane tasks like spotting crossing for the canals that were all around the countryside. One thing I always hear regarding the ACOG is, “What about CQB?” How do you use a 4x optic in close range shooting? That’s a good question, but it’s one easily answered. The ACOG can be just as useful as a red dot scope when you employ the Bindon Aiming Concept. The Bindon Aiming concept was created by Trijicon founder Glyn Bindon. Not every ACOG reticle is compatible with the Bindon Aiming Concept, but most are. The reticle has to give sufficient contrast to the background of the target. The BAC is simple, just keep both your eyes opened when you are looking through the optic. Your dominant eye should be focusing through the optic, and your nondominant eye should be observing the field in front of you. When focusing on a close quarters target the optic will act almost like a red dot. With the reticle superimposed over your vision and works extremely well. The brain is taking two images, the magnified image, and the unmagnified image and combine them together. The end result is a red dot just placed over your vision. 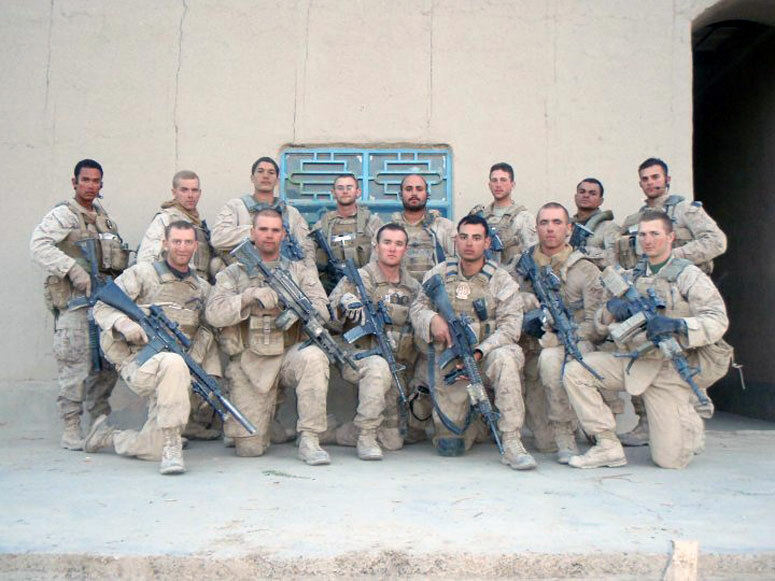 We shooting a number of ‘Tables’ in the Marine Corps. 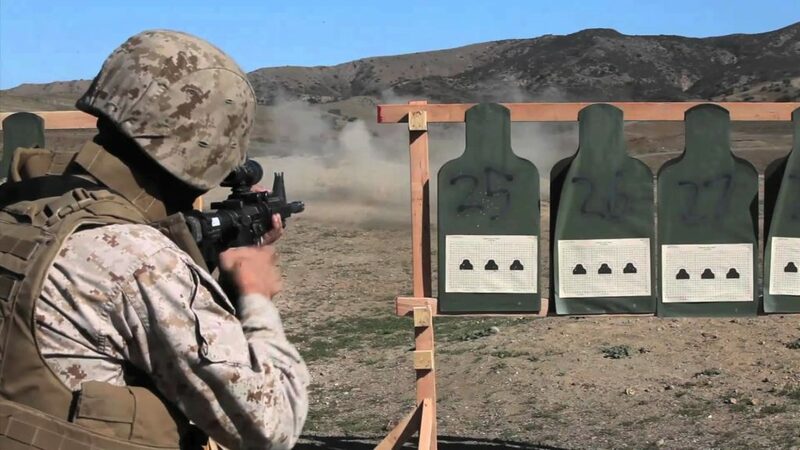 Tables in the Marine Corps are a set of shooting drills all combined into one long exercise. Tables 2,3, and 4 all fired at relatively close ranges. After a lot of practice, I became pretty damn good with the Bindon Aiming Concept. To go back to the magnified view you can either close your nondominant eye or learn to focus with just your dominant eye. The real way to use the BAC is to learn how to alternate focusing your eyes. So as much as I love this optic, it’s not entirely perfect. The ACOG is designed for combat, and a lot of its advantages do have a few cons. Battery-free illumination is excellent, and a self-regulating reticle is also pretty handy. The problem arises when its super bright outside the reticle becomes super bright. Too bright to be honest. 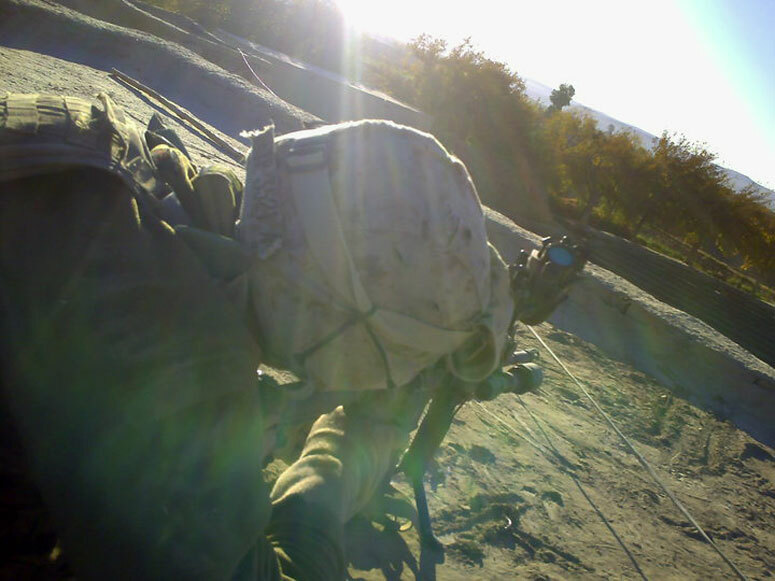 A universal cure in the Marines was to place tape over the red strip that collects light. That would often help dim the reticle just a bit. Afghanistan is a sunny place, but the reticle would get bright enough to make your eye uncomfortable. Also, the reticle auto adjusts to where you are, not where your target is. If you are in a dim environment, like inside a building, and aiming at something outside that’s a bit brighter your reticle will still be dim. It’s even worse if you are in a bright environment and aiming into a dark background. The reticle will make it almost impossible to see your target inside a darkened environment with a raging red reticle. The issue with using tritium to gather light is that it will eventually die. This does take years, and years to ever happen, but it will die. This can be a hard pill to swallow when you are looking at spending 1200 or more dollars on a scope. There are now battery powered ACOGs that found a way to beat this problem. They are limited to only a few models though. The ACOG is great, but Browe Optics is producing what’s best described as the ACOG Gen 2. These battery powered optics do away with a lot of the ACOG’s weaknesses. That being said I’ve never taken one to war and back so I don’t have the necessary experience to say which is better. I’d like to point out though that Browe was founded by the man that was Trijicon’s Director of Operations, so he and his company is very familiar with the product and what goes into a great optic. Since we’ve already taken a peek at the USMC’s ACOGs I figured we can shop around a bit and show off some of the other ACOGs out there. Oh man, this guy is just adorable. The ACOG model TA44-C-400 series is the most lit of the ACOGs. It’s a 1.5 x 16s scope that it more red dot that traditional optics. It’s a nice low profile optic that could be used on everything from an M4 to an MP5. It comes with one of two reticles that function a lot like an Eotech’s traditional reticle. The larger red or amber circle with a small dot in the middle. You’d use it the same way you would an Eotech. At close range, you fill the big circle with the body of your target and let it rip. At longer ranges, you use the more precise center dot to hit your target. This little ACOG uses the tritium/fiber optic combination for power and can be mounted to a carry handle or pic rail. It’s not specifically designed with a BDC so it can be used over a variety of weapons. If you want to reach out a little further than 4x allows there is a 6x Trijicon ACOG. This is an excellent little choice for a DMR or SPR build. It’s a bit big, but it’s completely functional and quite sturdy. The optic offers a 48mm objective lens which is a little more substantial than the 32 mm on 4x rifles. In fact, that’s pretty massive for a 6x optic. It does give a broad and bright field of view though. The 6×48 is another tritium/fiber optic combo with six different reticle variations available. 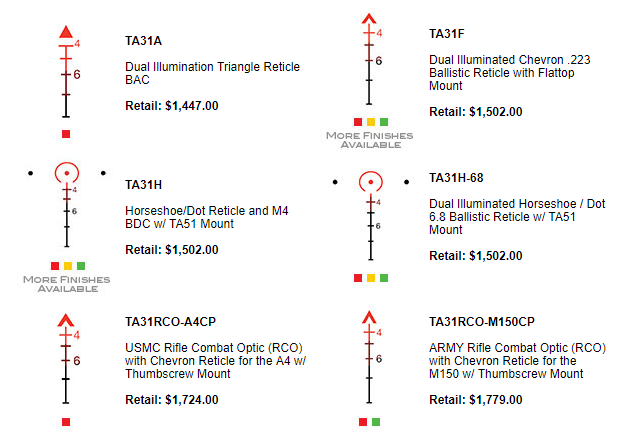 The reticles offer BDCs and are designed for a wide variety of rounds and guns. Seriously, this thing has an M2 50 caliber option, an M240 option, as well as .308 and .223 variants. The two battery models Trijicon offers gets rid of the tritium and fiber optics for a much more affordable and ordinary battery type illumination. The optics themselves are much more ACOG like than the previous two and come in 3.5×35 and 4×32. 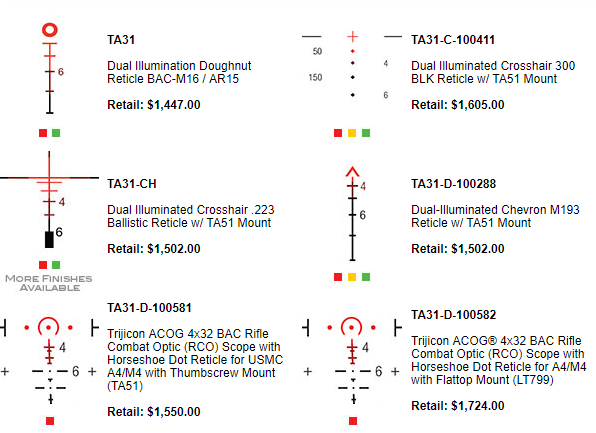 The 3.5×35 has six different reticle options with 3 for 223 and 3 for 308. A few of the reticles have the chevron reticle that’s very similar to what I used in the USMC. The 4×32 model has four reticle options, and three are for the 223, and we find the lonely 300 Blackout reticle. You do get a traditional USMC style chevron reticle system. These models require batteries, but when you are spending a lot of money on these optics you want them to last forever right? I believe the battery models are better for the individual users and the Tritium and Fiber optic models are better for the military and law enforcement community. Lastly, you can add a Trijicon RMR to the top of an ACOG via a very simple plate. This is a very simple upgrade that does give you a super close range option for close quarter’s shooting. The RMR is easily the most robust miniature red dot on the market, so it’s a faithful companion to the ACOG. Trijicon RMR – also perfect for pistols. The Trijicon ACOG is an outstanding rifle combat optic. It’s served its country well with the USMC, the Army, and Air Force. The Trijicon ACOG is a rugged, reliable and well designed and thought out combat optic. Make no mistake the Trijicon ACOG is a combat optic. It’s designed with fighting in mind, and that’s where the design comes from. Sure it can be used for other things, but its design is focused on combat, so remember that. This is my favorite rifle combat optic (so far) but what’s yours? Do you like the ACOG or are you an Aimpoint fan? Semper Fi Hardcharger. Great article. Now, cause of your dumb Grunt Knowledge, this 0341 going go out and get hisself one of them battery operated Trijicons. Huh. Back in my day we actually had to qualify, with our Alpha Two’s Irons. Ah well, pretty soon all yous will have to do is tell the ammo what target where, and that’s it. Closed curtains for them Hostiles. Nonetheless; big Parris Island Ooo-Rah and job well done, Marine.